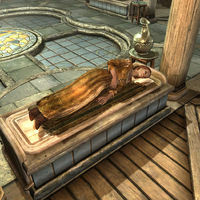 The Sickly Farmer is a Nord warrior being nursed back to health in the Temple of Kynareth in Whiterun. She is quite sick and will do nothing but lie on the healing altar and let Danica Pure-Spring or Acolyte Jenssen heal her, at times groaning, "The fever's down a bit, an' I can almost see straight. ", "I still can't hold nothin' down, but it's better than yesterday." and "My joints ache, I can't eat nothin' and my head feels like a furnace. I've seen better days." At other times, she will just utter, "So sick... can hardly stand it...", "The fever... my body burns..." or "Ohh... ughh..." The only exception to this schedule is during the Battle for Whiterun, when she flees for safety along with the other citizens. She wears a belted tunic and a pair of boots. She only carries an iron dagger. This page was last modified on 17 March 2019, at 17:20.